The funeral Mass for Father Ferdinand J. Wesloh was celebrated Oct. 26 in the chapel at Mother of Good Counsel Home in north St. Louis County. 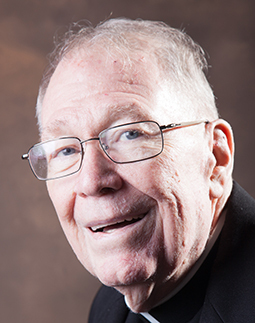 Father Wesloh, a longtime educator and pastor, died Oct. 22. He was 79 years old. A St. Louis native, he graduated from Bishop DuBourg High School and earned a master’s degree in education from Saint Louis University in 1967. Cardinal Joseph E. Ritter ordained him to the priesthood in 1964 at Saint Louis Cathedral. His first assignment was as assistant pastor at St. Peter Parish in St. Charles and Duchesne High School in St. Charles in 1964. In 1974, he went to St. Clement of Rome Parish in Des Peres as part-time associate pastor and taught at Mercy High School in University City in 1974. In 1977, he became associate pastor of St. John the Baptist Parish in south St. Louis and taught at St. John the Baptist High School; In 1981, he became part-time associate pastor of St. John the Baptist Parish in Gildehaus and administrator of St. Francis Borgia Regional High School in Washington. While there, he supervised construction of the new regional high school. He was named administrator of St. Ann Parish in Clover Bottom in 1982, while remaining as high school administrator. He also served as pastor of St. John the Baptist Parish in St. Louis from 1985-92; St. Angela Merici Parish in Florissant from 1992-2004; Our Lady Queen of Peace Parish in House Springs from 2004-08; and St. Martin de Porres Parish in Hazelwood from 2008-12. Father Wesloh also served two terms as dean of the South St. Louis Deanery. In 2012, he was granted retirement status at St. Agnes Home and moved to Mother of Good Counsel Home in 2018.